Allow 3 wraps per cake tin. Spray bottom, line inside wall with baking paper. Place a wrap in the bottom, cover with a layer of mince, black beans, corn, cheese then another wrap. Then repeat. Finish with a wrap on the top, and egg wash to brown. Cook in 180 degree oven for 30 mins, turn oven off and leave in oven to sit for 30 mins. Grill the tops before serving. OR make in morning or day before to refrigerate then heat up. 1 Place broccoli florets in a large heatproof bowl and pour over boiling water to cover. Leave for 5 minutes to lightly cook. Meanwhile, get a large bowl of iced water ready. Drain broccoli and place in bowl of iced water (this helps the broccoli retain its bright green colour and crunchiness). 2 Thinly slice apple, then cut into thin matchsticks and place in the bowl the broccoli was cooked in. Squeeze lemon juice over the apple to prevent browning. Lightly toast almonds in a dry fry pan (no oil) on medium heat, shaking the pan frequently to avoid burning, for 2-3 minutes, until light golden. 3 Mix dressing ingredients together and season with salt and pepper. 4 Drain broccoli well and toss with apple, cranberries, spring onion and half of the dressing. Drizzle with remaining dressing and scatter almonds on top. Toss all ingredients and add salt and pepper as required. 1 Preheat oven to 2oo•c. Line an oven tray with baking paper. Toss kumara with a good drizzle of olive oil on prepared tray, season with salt and pepper, and roast for about 30 minutes or until golden and tender. 2 In a bowl, mix red wine vinegar and splenda together and add red onion. Leave to marinate for about 15 - 30 minutes. Drain, reserving vinegar for the dressing. 3 Place asparagus in a pot or heatproof dish or bowl, and pour over boiling water to cover. Leave to stand for 5-10 minutes until asparagus is lightly cooked through (but still crunchy). Drain and place in a bowl of iced water to quickly cool (this helps it retain its bright green colour) then drain again. 4 Mix all dressing ingredients together. 5 Toss roast kumara, asparagus, parsley, walnuts, and half of dressing, pickled red onion and parmesan together. Scatter over remaining pickled red onion and parmesan, and drizzle with remaining dressing. Brown cashews in frying pan, remove. Scramble 2 eggs and set aside. Add spices, cauliflower rice, parsley cashews and scrambled eggs. Add black sauce and pepper, mix well and serve. Zest and peel the orange. Add the zest and flesh of the orange plus all the orange hoisin ingredients to a saucepan and bring to a boil over a low heat - so this means slowly! Simmer for about 5 minutes, then pour into your blender or food processor. Blend on high until smooth (strain if necessary). Cut the chicken into bite-sized cubed pieces. Add the oil to a large skillet over high heat, and add in the chicken. Allow to cook, stirring occasionally, for about 5 minutes or until mostly cooked through. Add the orange (Hoisin) sauce to the pan, bring to a simmer, and allow chicken to cook in the sauce for another 3-4 minutes, stirring occasionally. Season to taste with salt and pepper. Fry onion, garlic and chicken in a frying pan with olive oil. Add rest of ingredients to pan, simmer for 15 minutes. 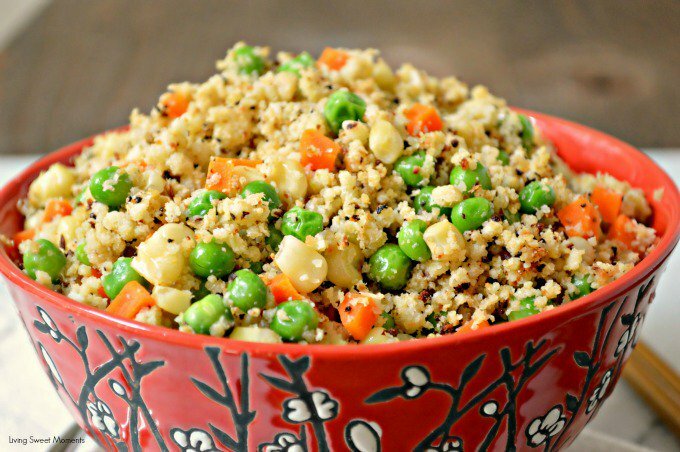 Serve with cauliflower rice or cucumber salad. Preheat oven to 220 degrees placing whole capsicums on a tray. Roast for 35-45 mins, turning often until charred and blistered. Set aside to cool, then peel off skins. Slice flesh and discard seeds. 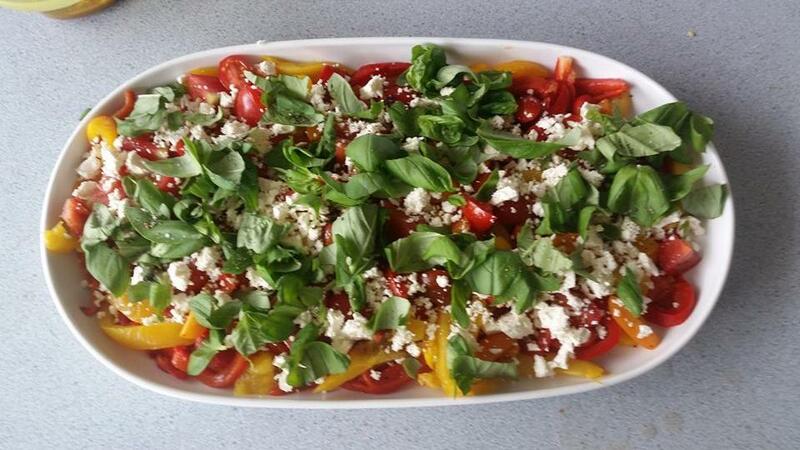 Arrange tomatoes and capsicum on a large serving platter and scatter with crumbled feta and basil leaves. Season with salt and pepper, dress with lemon juice, olive oil and zest. Drizzle with balsamic glaze. Combining all above ingredients and roll into golf ball size balls, and brown in frying pan with drizzle of olive oil. Place in baking dish in a single layer. Leave to one side. Pour sauce over meatballs in casserole dish, sprinkle with cheese mix and bake in oven for 40 mins.